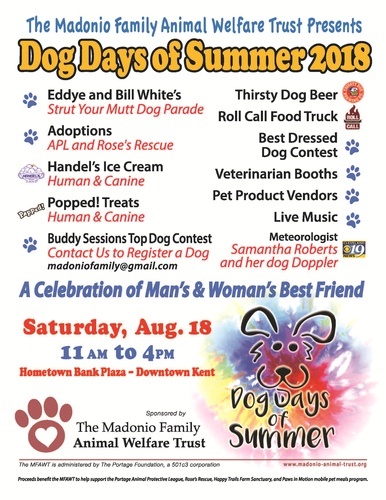 The Madonio Family Animal Welfare Trust will be holding the 4th annual Dog Days of Summer. More than 200 dogs and nearly 3,000 people attended the event which included Eddye and Bill White Strut Your Mutt Parade, Top Dog Contest, Owner-Dog Look-Like Contest and the Biggest and Smallest Dog Contest. The event also featured bands such as The Dirty Shirleys, Fallout, FOG and the Bluestones. Food was available thru Roll Call and The Brimfield Lions food trucks and Thirsty Dog beer was on tap. More than 30 booths, including veterinarians, dog product vendors, pet adoptions, information, free spray tattoos for people and dogs and special dog treats from Handel's Ice Cream and Popped. In addition to a day of family fun, the event also raised over $19,000 that will go to support the Trust's causes - humane animal rescues and Paws-In-Motion, a program that feeds dogs and cats of elderly residents in the Meals-in-Motion program.